Look! Look! 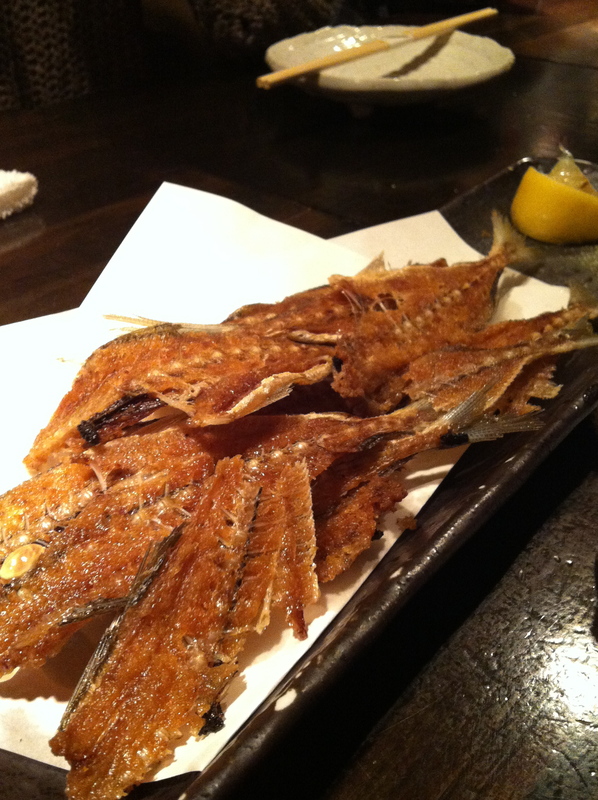 They have fish bone crackers on the menu at this izakaya! I love fish bone crackers! What? Oh, haha, don’t you mean “fish bone” crackers? Eww, does that mean what I think it means? Yeah, they’re made from real fish bones. Little fishie spines, little fishie ribs, little fishie tails, little fishie fins, all deep-fried to crispy perfection with seasoning salt. Try one! You mean…there’s no meat. No meat at all. Just…bones. Yeah. They’re crunchy! Better than potato chips. Try one! TRY ONE. See? They’re great, aren’t they? Hey! Hey stop that! Get your own order! Those are mine! And think of all that calcium, not to mention the omega-3s! I… kind of what to try that. I won’t choke on the bones right? No, but I have to admit, I was kind of worried about that too! I’m not sure why it’s not a problem – maybe because the fish are really little and they don’t have big inflexible bones like salmon? Or maybe because the bones are all stuck together in whatever secret ingredients the fish are covered with before frying? Eating these really was more like eating potato chips than eating fish!